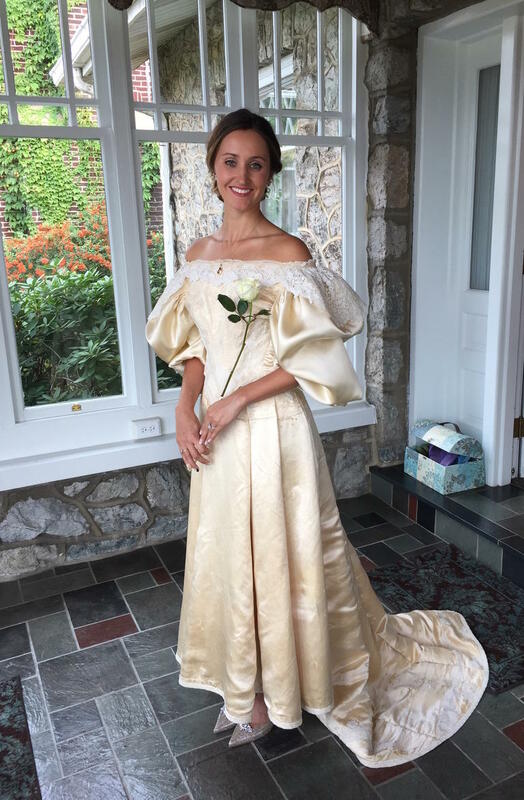 Did you hear about the bride, Abby Curtis that was the 11th bride in her family to wear a lacy Victorian 120 year old couture wedding gown on her wedding day? 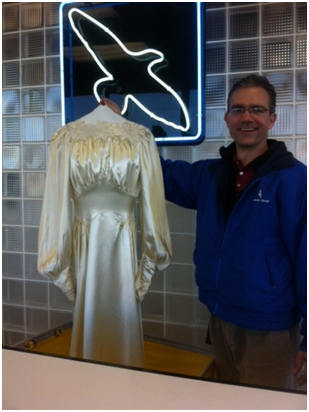 It was originally her great-great grandmother’s dress, dating back to 1895. Talk about some fantastic preservation work. But she did go on to say, that because of its fragility, she only wore it for the cocktail party and to sign her official marriage license. I cannot imagine how cool it would be to wear something with so much family history on such a special day. According to the 2012 American Wedding Study, 46% of brides preserve their wedding dress for their children or grandchildren, and I suspect that number will continue to rise. So how is wearing a vintage gown different from wearing a new gown? First, you need to consider what sort of condition it’s in. Was it stored in an acid-free, museum-quality, archival wedding chest lined with fabric or acid-free tissue or was it covered by a plastic bag and sitting in someone’s closet? If gowns are not stored in ideal conditions, they are likely to yellow significantly and have discoloration spots. If you are thinking of wearing a vintage gown, take it to a professional dry cleaner and allow them to inspect it carefully. After the review, discuss the options with your cleaner before moving forward. 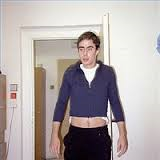 Second, proper fit could be an issue. When selecting a brand new gown, you have the luxury of finding the best size for alterations. With a vintage gown, there are no sizing options – you start with what you have. Do some research and find a seamstress that specializes in wedding gown alterations. Taking the dress in is no problem, but what about letting it out? There are lots of options here: you can let out seams and darts, add side pieces in the bodice and sleeves from the train, find matching fabric, or remove zippers and add a corset back. Finally, as with any gown, have it cleaned and preserved by a qualified specialist as soon as possible after your big day; the longer you wait, the less likely it is that all stains and spills can be removed. My guess is since you’re wearing a vintage gown, then you probably want to keep it. Then be sure to inspect your gown before it is put into the preservation container, which should be a completely acid-free, museum-quality, archival wedding chest lined with fabric or acid-free tissue. And once you have the gown home, never store it in an attic or basement where there are extreme temperature changes and humidity. With the proper care, your gown will remain the well-preserved treasure it is and will be safe, secure, and waiting for the next family bride that wants to wear it on her special day. When I was a little girl, my dad was a member of the local Elks Lodge. My sister and I spent plenty of time up there while my dad volunteered. Sometimes it was fun because we got to get a Coke and a bag of M&M’s, and other times it was simply boring because we had to dress up and sit quietly while the adults talked --- for a really, really long time. Like during the annual Flag Day ceremony; in the eyes of an eight year old little girl, it was torture. If only I’d understood the significance back then like I do today. Back then, I had no idea what the Elks Lodge was about; I had no idea about their involvement in Veterans programs, youth programs, and Americanism. Looking back, it seems altogether fitting that an organization like this would like to acknowledge and show respect for the American Flag and all that it represents. I searched for a photo of my dad at one of these ceremonies but was unsuccessful; however, my mom and I did find this one at the Elks Lodge in Mount Vernon, Indiana. He's the handsome dude on the right in the super-cool jacket. The thing is, you don’t have to be the member of a special organization to show respect for the American Flag. One of the easiest ways to honor the American Flag and our country, is to keep its colors looking bright and strong, and the best way to do that is to have it regularly cleaned. But don’t go thinking that you have to do this yourself because A Cleaner World cleans American Flags for free – every day. We always have; we always will. If it will fit in the machine, we’ll clean it for you. No questions asked. 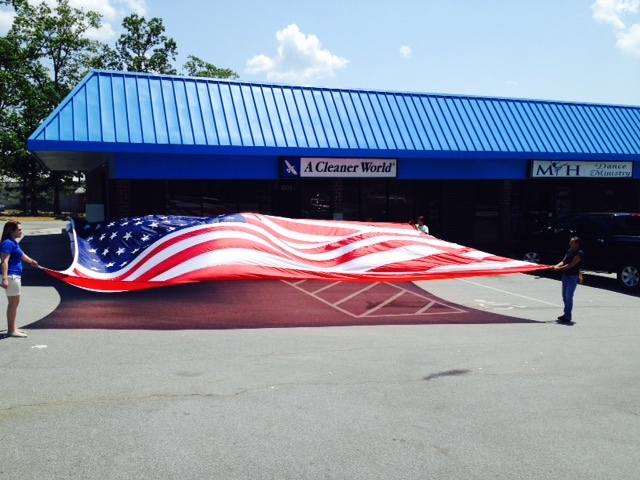 Just check out this huge flag we cleaned at our Thomasville location. All you have to do is drop it by one of our locations, and we’ll gladly clean it for you and have it ready when promised – at no charge. Frequent dry cleaning causes clothes to wear out more quickly. Actually it’s the opposite. First, dirt and soil that build up on clothes eventually acts like sandpaper and causes the fibers to wear down more quickly. Second, products like deodorant, toothpaste, make up, and lotions end up on clothes. If left for a long time, they can cause discoloration or color loss. Third, insects are attracted to dirty clothes. Placing dirty clothes back in your closet is like hanging a neon welcome sign for insects to start munching on dirty fibers. Finally, spills that are left untreated for a long period of time become part of the fabric. See number 2 for more information. All stains can be removed. We’ve talked about this before and sadly they cannot, for various reasons. First, a stain left untreated for a long period of time becomes part of the fabric, so if the stain can actually be removed, the fabric where the stain once was is now a different color. Second, certain stains on certain fabrics can be especially difficult to remove without causing damage to the garment. Third, not knowing what the stain is can make it more challenging to remove, and too many attempts at removal could again cause damage to the fabric. Garments don’t shrink. Actually they can if the material hasn’t been properly preshrunk. Most of the time, shrinkage occurs gradually. Most manufacturers consider a 2-3% shrinkage factor acceptable, but if there’s a lot of shrinkage after the first cleaning, then that’s considered excessive shrinkage. The bottom line is that shrinkage goes back to the way the garment was manufactured. The care label is always right. Sadly it’s not. In 1972, the Federal Trade Commission launched the Care Labeling Rule, which required manufacturers to label their clothing with instructions for at least one safe cleaning method. But according to the Dry Cleaning Laundry Institute, ‘that rule does not require testing before care instructions are assigned to a garment – only that a manufacturer have a reasonable basis for their care instructions.’ With our years of training and experience, we’ve learned that we have to be smarter than the label. Dry cleaning harms the environment. Perchloroethylene, the dry cleaning solution we use, is from the same group of cleaning supplies used in household cleaners and swimming pools. While the dry cleaning industry is heavily regulated with high standards, A Cleaner World’s internal standards are even higher. Not only do we continuously purify and recycle our cleaning solution to minimize waste and increase efficiency, we also regularly test air quality in our plants, keep our equipment running safely and efficiently, and recycle our poly bags and hangers. A Cleaner World is committed to doing our part to keep the environment safe and clean.